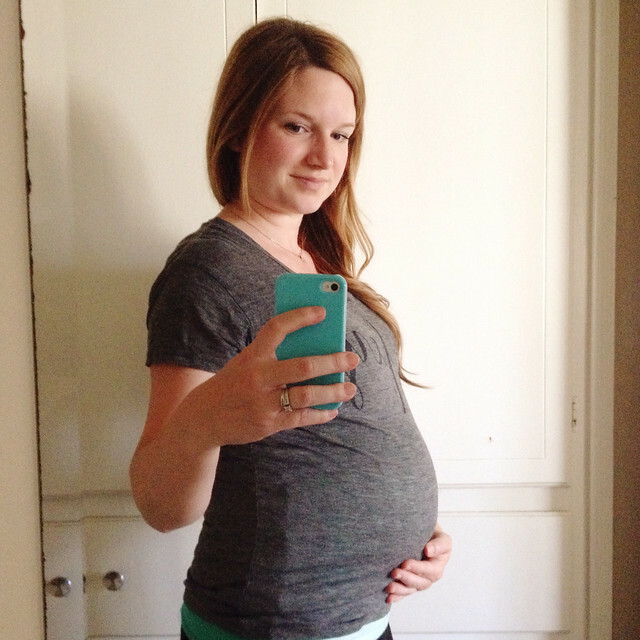 Hellooooo, third trimester! (I may be entirely too excited over this. True story.) This past month has packed quite a punch, and I'm definitely out of the I-hardly-feel-pregnant stage. As always, I have to say that every single bit of it is completely worth it, and I'd do it all over again in a heartbeat. Symptoms: I'm definitely more uncomfortable at this point, and my belly often feels tight and heavy and all-together in the way—making it tough to eat the meals my heart sometimes desires, and having a container of Tums within arms reach has become a real necessity. One thing I'm loving, however, is the fact that this baby is ridiculously active—morning, noon and night. She is busy twirling and kicking around in there so often, and it never gets old. (I can often see my belly moving around from the outside, which is always the most bizarre/awesome thing in the world.) Sleep-wise, I'm having trouble getting comfortable in bed at night, and have also returned to napping with Eisley in the afternoon (when she decides to take one!). Body: The difference in my belly from last month to this month feels huge. Strangers often comment on it and the pregnancy when we're out and about, which is one of my favorite things. (I love how motherhood has made the world a smaller and more friendly place.) I may soon have to say goodbye to jeans altogether (both maternity and otherwise) because I find them wildly uncomfortable. Maxi skirts are my best friends right now. And when it comes to my body overall, I truly love how I look. My pregnant body is constantly changing and sometimes feels like it isn't mine at all, but I think it's beautiful. This time around, I'm much more in awe of all it is capable of, as it grows and sustains this new life. You're a beautiful pregnant woman! You're almost there! Wooh! your writing is my absolute favorite! also!? i am excited for the name reveal, whenever that may happen! Eeeeee, hurray third trimester! You look fabulous and so glad you're loving your body. I know by this point in pregnancy jeans were never going to happen, it was all about skirts and leggings, ha.